​In my jewellery I combine non-precious and precious materials. The creation process of my work is lengthy; it takes me many days, if not weeks, to complete a piece of jewellery. I work in an organic manner and combine unusual and unique materials. The result is tactile and wearable light-weight jewellery. 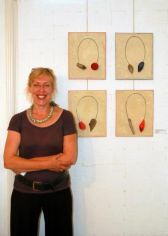 ​Recognise the original materials in my jewellery may require a second or even a third close look. My jewellery echoes the sea, contemporary and striking. ​Each piece is handmade and unique.